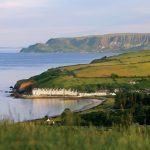 Hazelwood is a 4 Star luxury Self-Catering accommodation in Glenariff, in the Glens of Antrim situated on the famous Causeway Coastal Route. 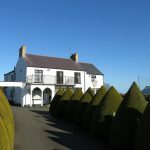 Hazelwood is located a one minute walk from Glenariff Forest Park/Waterfalls and Laragh Lodge licensed restaurant and has panoramic views over Glenariff Glen. All of the accommodation is based on the ground floor and is equipped to a very high standard. The living room has an open fire with Sky Freeview TV and DVD. Kitchen/Dining area is very spacious and opens out to patio area with patio furniture and barbecue. Hazelwood sleeps 5 people, there are 3 bedrooms, one double en-suite. There is also a twin and single bedroom. There is a separate bathroom with bath, shower and toilet. Facilities also include washing machine, tumble dryer, fridge/ freezer, dishwasher, electric hob/ oven, microwave, food processor, toaster and kettle.